Slip your feet into a whole new level of comfort. 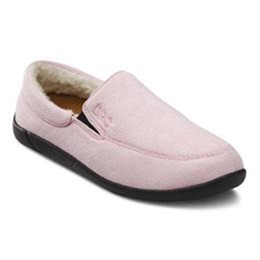 Designed with soft, fleece lining and microfiber uppers, the Dr. Comfort® Cuddle women’s slipper delivers plush comfort whether you’re relaxing or walking around the house. The Cuddle offers plenty of room to help accommodate swollen, achy feet, while the closed heel helps to provide support and stability without irritating the skin. Plus, the rubber outsole helps deliver traction so you can walk around safely. Dr. Comfort gel inserts deliver comfort. Rubber/EVA outsole helps prevent slipping when walking. 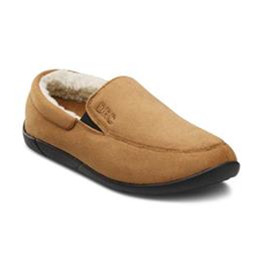 Soft suede-like uppers and fleece lining provide comfort and support to the feet. Closed back delivers support, easy on/off application, and accommodates swollen feet and helps to prevent skin irritation.